I wasn't planning on joining any more challenges this year. I'm trying to keep things simple. But Sheila at Book Journey is hosting a challenge that I couldn't resist. 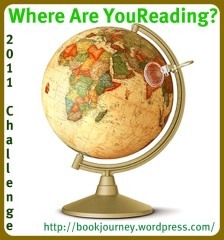 It's the Where Are You Reading Challenge. You're supposed to read "at least one book that covers each of the 50 states of America and you can add as many other countries as you like." Now, I'll admit that I'm not going to pick books just based on where they take place, so the chances of me actually succeeding in reading all 50 states is slim. But, I thought it would be fun to keep track of where the books I read actually take place, to see how varied they are. And maybe the drawing for a $50 gift card for those who do read books from every state will be motivation for me to read the last few states toward the end of the year! Oh, and if you want to keep up with where I'm reading, scroll to the very bottom of the page to see my map! I'm doing it, too, in the same way - mostly just tracking where I read, not worrying too much about any goals. I've got a slow start, though - the NF book I'm currently reading has absolutely no location associated with it!